How do you get version 1.1? Please post your action replay codes for super mario 64 ds. Version 1.1 only! How do i defeat bowser? This page contains Super Mario 64 DS cheats list for Nintendo DS version. Now we have 105 cheats in our list, which includes 11 cheats codes, 8 unlockables, 9 easter eggs, 19 glitches, 58 secrets. We hope information that you'll find at this page help you in playing Super Mario 64 DS on Nintendo DS platform. If you didn't find needed cheats put request or ask question about this at special section of the game. Also you can subscribe on all new cheats that we'll find for you in the future! 1. Go and get Luigi. (If you do no have Luigi, you can find himby doing the same thing just going into the Wario painting! 2. Up the Tower stepts and into the mirror room. 6. You be in a white room so get that star BABY! Head straight and go into the mansion. Run foward and triple jump onto the second floor. From there, head to the farthest right door. Grab the power flower, and float up to the secret door. Ground pound there, and go through the door. Head right, and go in the Luigi painting! Head to the right door. Then take the left. Take the right one again, and then take the elevator thingys to the farthest left one. So take three of those things, and run foward all the way to the painting of boo. then take the lifts, and head in the chimney hole. Run up to the mirror, and watch as Big boo comes. Now sneak up on him using his shadow and the mirror. Punch a lot of times, and the luigi key is yours. Enter the Bob-Omb battlefield,then eat something that can be made into an egg then get into a cannon and aim anywhere and press a. You need to go to the stage called Bomb Omb Field. Go to a level that allows you to us Cannons. Now, go across the bridge and go straight until you get to a Cannon on a big stone. Now, you want to aim your cannon a little bit more downward than the picture above. Line up the bottom arrow's bottom edge against the land with the big mountain. (The land closer to you) Then press A to fire. Mario will be blasted into the land, and then the game will glitch. Mario will disappear, and he'll be miles up in the sky, falling and he'll land on the top of the mountain, but taking damage along the way. If you're Yoshi,you can swallow small,square,wooden boxes(for example,a box like the one at the beginning of Hazy Maze Cave)and turn them into square eggs! (Mario key) Beat King Gooboss:(Yoshi & 8 star room) Run behind him. Then eat a little gooba, throw the egg at him. HE get bigger and faster the more you hit him.After hitting him 3 times he gives you the key. (Luigi key) Beat King Boo: (Mario & garden with big boo) Go into the haunted house find the room with the picture of Luigi go up until you see the king boo picture go down. Beat him by punching him when he is visible then after 3 times he gives you the key. (Wario key) Beat Cheif Chilli : (Luigi & mirror room )You punch him off the iceberg. Then he comes back up and makes it smaller. Once the thing is super small he gives you the key. (Wario key) Beat Cheif Chilli (Luigi & mirror room )You punch him off the iceberg. Then he comes back up and makes it smaller. Once the thing is super small he gives you the key. (Luigi key) Beat King Boo (Mario & garden with big boo) Go into the haunted house find the room with the picture of Luigi go up until you see the king boo picture go down. Beat him by punching him when he is visible then after 3 times he gives you the key. (Mario key) Beat King Gooboss (Yoshi & 8 star room) Run behind him. Then eat a little gooba, throw the egg at him. HE get bigger and faster the more you hit him.After hitting him 3 times he gives you the key. You need to be able to access the Star Door at the top of the stars in the main room. Go through there. *As Luigi* Enter the doorway at top and you'll find yourself in a room with a huge mirror. Grab the Power Flower and run through the mirror. You then get to the otherside and jump into the picture of Wario's face. You need to go through a path with Bully's, platforms, and a few other things. At the end, there is a hole. Jump into it and you fight with the boss, Chief Chilly. Chief Chilly is the boss you need to defeat to get Wario's Key. To defeat this boss, you need to push him off of the battle area 3 times. What you need to do is to get him to go closer to the edge. When he is near, punch him or dive into him to push him off of the battle area into the bluish sea. He'll bounce up and down and then get back onto the battle area. He'll destroy some of the outer part of the area, meaning there is less space to walk on. Now, you'll have to do the same thing again, and he'll bounce back on the battle area, breaking the outer part again. Not only is there little room to move, you'll have to try even harder to defeat Chief Chilly. Repeat the same process, but as he is about to fall off the battle area, he'll stand on the edge, wobbling and trying to stay on. Punch him quickly and he'll fall off. You will then get the key to open Wario's Door and unlock him. Okay, I hoped this helped. Do this trick by breakdancing. But quickly flip over after. If you are running stuck on the last bit of the hill, don't just jump! Instead, jump and while youe in the air, Press B to scoop. Good Luck,! To use the Moon Jump Code, Press B repeatedly when in the game. Try not to use in cut-scenes because it will screw up or glitch the game. Some *** glitch is screwing this cheat up. The part with the D00 thing should be one D and 12 0's after it. If you want to stop the gears and platforms to stop moving in the Tick Tock Clock levels, jump into the clock when the minute hand is on the 12. If you jump in when the minute hand is on the 3, the speed will be slow. 6 would be medium speed and 9 would be fast speeed for the platforms and gears. In the room with 4 doors that have these symbols on them: M, L, W, and -, there is a portrait of Peach on the left and right. Jump into the one on the right to fins this hidden slide. Finish the level and a star awaits you at the bottom. Make Yoshi as your character then head outside the castle. There will be some bunnies running so try to swallow them. Spit them out then they'll give you a key to unlock some games for peaches game room. Note: These keys are for Yoshi's game only. If you're injured,you can heal WITHOUT taking coins. Just jump into the water,then stay afloat.The life bar will heal as if you're underwater for too long. Go to Peach's playroom There is a picture on the left and it's a beach landscape Enter and collect all 5 silver stars Your pretty much done. Cannon To access the cannon outside the castle, get 150 stars. There are three 1-ups, a cap and Luigi's rabbit. Thanks for the Super Mario Wiki for this one. 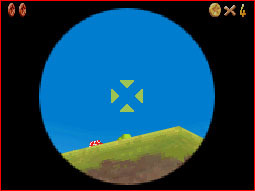 As any character, the player should go to Bob-omb Battlefield. Then they should go into the tall cannon near the Koopa. They should aim for the bottom of the floating island, and fire. 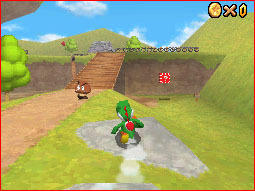 If Up is held the entire time, the player will be pushed through the fence and end up extremely high in the air, above the mountain. They will eventually be sent out of the level's boundaries, making them lose a life after about ten seconds. Go up to the middle room on the 2nd floor (you need Luigi) and go to the mirror room.Get a Power Flower and punch the mirror. Go to the Wario painting. Beat the big dude and you'll get Wario's key. I hope this cheat helps! U know the courtyard Go there (u need 20 stars or so though). Ground pound (kill) the big Boo and enter the bird cage. Go into the mansion, through the main entrance, and get onto the balcony thing above the first hallway. Go into the room furthest to the right and get onto the stage. Using Mario, get up, onto the platform above u, and go through the door. Get into the Luigi painting. Go through the door to the right, then left, and so on until u get to a room with a massive collapsing bridge. Go across it, and then use the green lifts to get up into a hole, go in. Look in the mirror (zoom in) and defeat King Boo, to unlock Luigi. P.S. Ground pound him and it has more effect. Go where you see a small,puffy cloud with a face. It is not Lakitu. When you're near it,you will see a wall with coins floating around it. Jump into it and you're in a secret slide!